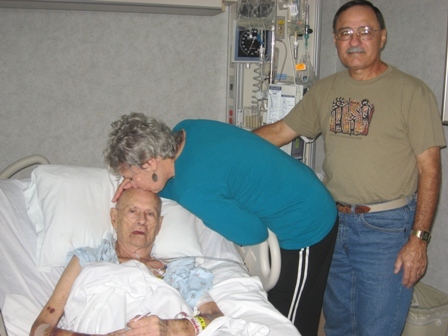 Mom healed quickly from her heart surgery and was able to leave the hospital; Dad wanted to spend his last days at home with Mom, so he went into hospice care. We knew he didn’t have much time in this human body — it was tired from so much living. It was time to let go of him as my earthly father. I knew that his spirit would soar! His soul was ready. And I knew he wasn’t afraid to let go because he had already shared his beautiful near-death experience with me. This entry was posted in Uncategorized and tagged cancer, Cathy W. Lauro, end of life, final words, finding joy, gratitude, heart warming, inspiration, last looks, letting go, live deeply, near death experience, saying goodbye, spiritual journey, The Inside Advantage. Bookmark the permalink.